The Enhanced Edition features additional content, Controller support, updated visuals, bug fixes and more. Savegames from the original are not compatible with the Enhanced Edition. 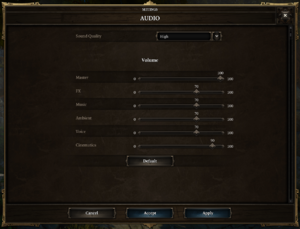 Free to owners of the original Divinity: Original Sin. On OS X, HFS+ case sensitive partitions not supported. Use BetterCamera for DOS EE. Optional frame rate cap up to 120 FPS. Some actions cannot be remapped. 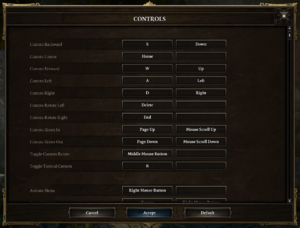 Controller has to be enabled in the options in main menu. Effects, music, ambient, voice and cinematics. 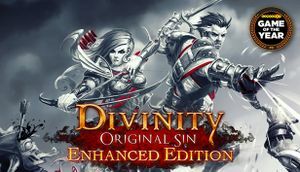 See Helix Mod: Divinity Original Sin - Enhanced Edition (Update 12.05.2018). Larian Studios has hard-coded a check for a string only set by the propriety divers. Ensure you have installed gcc and the headers for libc and OpenGL (on Debian and Debian-derived distributions you should install build-essential and libgl1-mesa-dev). Download the shim from here. Compile the shim from the command line with gcc -s -O3 -shared -fPIC -o shim.so -ldl shim.c. Set the game's launch options in Steam to allow_glsl_extension_directive_midshader=true LD_PRELOAD="/path/to/shim.so" %command%. Requires the user to compile the shim. This fix works for systems using open source Intel GPU drivers, also. Depending on your system, you may need to add ALSOFT_DRIVERS=pulse to the launch options. 4 OS X and Linux only. This page was last edited on 11 April 2019, at 20:35.